“Superhero lessons from Geese!” A guest blog post by Pants on the Outside! Who would have thought that a flock of Geese could have anything to tell us about working better together as a team, but it turns out that actually they have plenty we can learn from, so at Superhero HQ we’ve been busy taking notes. There are several lessons that we can make use of in the business world, but the facts that I am focusing on is simply this…. 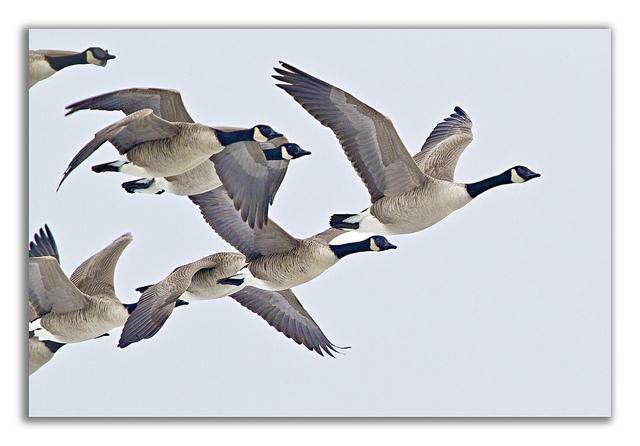 FACT *- As geese flap their wings, they create an uplift for the bird following. By flying together in a V formation, the flock’s flying range is 71% greater than that of any bird flying alone. SUPERHERO HQ LEARNING – When we share a common direction and sense of community & teamwork, we can get where we are going more quickly and easily because we are travelling on the energy of another. When you stop to think, this strategy has been seen in action recently in the Olympic and Paralympic Velodrome at the London 2012 Games. Within the Velodrome, famously rubbed down in rhubarb (but actually covered in a solution which contains a compound found in rhubarb) and specially designed to smash world Records, the Team Pursuit tactics took advantage of the same effect. Listening to Chris Boardman speaking about the team pursuit event, he says that 90% of the energy expended by a cyclist is focused on pushing air out-of-the-way, so tactics have been developed to work together to maintain an aerodynamic shape and reduce this drag effect. Rather like the Geese, the Team Pursuit cyclists ride in string formation just centimetres away from each other and regularly change this formation to share the workload and create the best conditions for the whole of the team. Every half lap the leader at the front of the team, who has been using the majority of their energy to push through the air, swinging up the bank and then down again to rejoin the back of the string, allowing them to recover their strength and enjoy the benefits of greatly reduced drag. This well-practiced example of teamwork in a highly competitive situation, cheered on by a 6,000 strong crowd, saw World Records smashed and dreams realised. At Superhero HQ we’ve really taken on board the learning from what has been described above and we have been rotating our team and leadership responsibilities, taking the lead when we can and playing to our strengths to reduce the drag felt within the team. Sometimes this is decided amongst the team but just as often we naturally gravitate to the front when we know that we can take the lead and use our talents for the benefit of everyone. Sustained teamwork is a concept that we are passionate about and so it’s not surprising that The Pants on the Outside experience has been designed to help teams find their common direction, create masses of energy and share the benefits of working together because we have all experienced the benefits that this brings. Get in touch and tell us about how your team is working together to reduce ‘drag’ and create success. * In the past I have been asked about where the scientific proof for the 71% comes from and to be honest I’m not at all sure, but for the benefit of the thinking, I hope that you can feel happy enough to go with it!